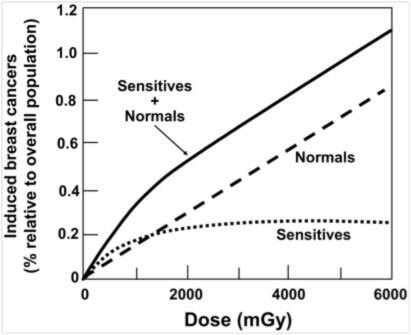 "Cancer risks attributable to low doses of ionizing radiation: Assessing what we really know"
1. International Commission on Radiological Protection (1991) 1990 Recommendations of the International Commission on Radiological Protection (Pergamon, Oxford). 2. Preston, D. L., Shimizu, Y., Pierce, D. A., Suyama, A. & Mabuchi, K. (2003) Radiat. Res. 160, 381– 407. 3. Doll, R. & Wakeford, R. (1997) Br. J. Radiol. 70, 130–139. 4. Doody, M. M., Lonstein, J. E., Stovall, M., Hacker, D. G., Luckyanov, N. &　Land, C. E. (2000) Spine 25, 2052–2063. 5. Gilbert, E. S. (2001) Am. J. Epidemiol. 153, 319–322. 6. Kelly, H. (2002) Pub. Interest Rep. J. Fed. Am. Sci. 55, 1–10. 7. Pochin, E. E. (1976) Health Phys. 31, 148–151. 8. Land, C. E. (1980) Science 209, 1197–1203. 9. National Research Council (1995) Radiation Dose Reconstruction for Epidemiologic Uses (Natl. Acad. Press, Washington, DC). 10. National Council on Radiation Protection and Measurements. 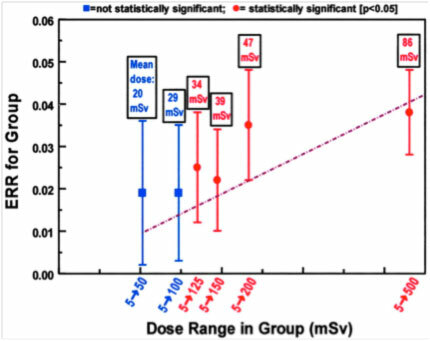 (1980) Influence　of Dose and Its Distribution inTime on Dose-Response Relationships for Low-LET Radiations (NCRP, Washington, DC), Report No. 64. 11. Brenner, D. J. (1999) Radiat. Res. 151, 225–229. 12. Pierce, D. A. & Preston, D. L. (2000) Radiat. Res. 154, 178–186. 13. Pierce, D. A. (2002) J. Radiol. Prot. 22, A147–A154. 14. International Commission on Radiological Protection (1999) Genetic Susceptibility to Cancer (Pergamon, Oxford), ICRP Publ. No. 79. 15. Herold, D. M., Hanlon, A. L. & Hanks, G. E. (1999) Int. J. Radiat. Oncol. Biol. Phys. 43, 475– 479. 16. Mole, R. H. (1990) Br. J. Cancer 62, 152–168. 17. Cardis, E., Gilbert, E. S., Carpenter, L., Howe, G., Kato, I., Armstrong, B. K.,　Beral, V., Cowper, G., Douglas, A., Fix, J., et al. (1995) Radiat. Res. 142, 117–132. 18. Muirhead, C. R., Goodill, A. A., Haylock, R. G., Vokes, J., Little, M. P., Jackson, D. A., O’Hagan, J. A., Thomas, J. M., Kendall, G. M., Silk, T. J., et　al. (1999) J. Radiol. Prot. 19, 3–26. 19. Ashmore, J. P., Krewski, D., Zielinski, J. M., Jiang, H., Semenciw, R. & Band,　P. R. (1998) Am. J. Epidemiol. 148, 564–574. 20. Sont, W. N., Zielinski, J. M., Ashmore, J. P., Jiang, H., Krewski, D., Fair, M. E.,　Band, P. R. & Letourneau, E. G. (2001) Am. J. Epidemiol. 153, 309–318. 21. Ron, E., Modan, B., Preston, D., Alfandary, E., Stovall, M. & Boice, J. D., Jr. (1989) Radiat. Res. 120, 516 –531. 22. Ron, E., Lubin, J. H., Shore, R. E., Mabuchi, K., Modan, B., Pottern, L. M., Schneider, A. B., Tucker, M. A. & Boice, J. D., Jr. (1995) Radiat. Res. 141, 259 –277. 23. Darby, S. C., Olsen, J. H., Doll, R., Thakrar, B., Brown, P. D., Storm, H. H., Barlow, L., Langmark, F., Teppo, L. & Tulinius, H. (1992) Br. Med. J. 304,　1005–1009. 24. Stevens, W., Thomas, D. C., Lyon, J. L., Till, J. E., Kerber, R. A., Simon, S. L., Lloyd, R. D., Elghany, N. A. & Preston-Martin, S. (1990) J. Am. Med. Assoc. 264, 585–591. 25. 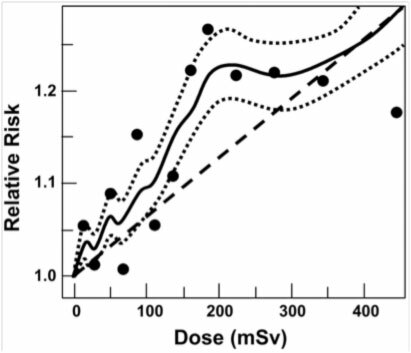 National Council on Radiation Protection and Measurements (2001) Evaluation of the Linear-Nonthreshold Dose-Response Model for Ionizing Radiation　(NCRP, Bethesda), Report No. 136. 26. Barcellos-Hoff, M. H. (2001) J. Mammary Gland Biol. Neoplasia 6, 213–221. 27. Nagasawa, H. & Little, J. B. (1999) Radiat. Res. 152, 552–557. 28. Ullrich, R. L. & Davis, C. M. (1999) Radiat. Res. 152, 170–173. 29. Little, J. B. 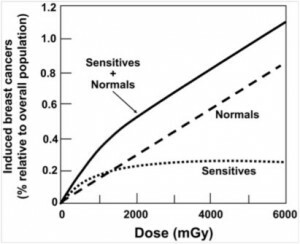 (2000) Carcinogenesis. 21, 397–404. 30. 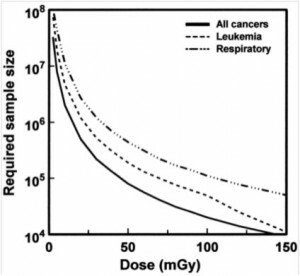 Hall, E. J., Schiff, P. B., Hanks, G. E., Brenner, D. J., Russo, J., Chen, J., Sawant, S. G. & Pandita, T. K. (1998) Cancer J. Sci. Am. 4, 385–389. 31. Smilenov, L. B., Brenner, D. J. & Hall, E. J. (2001) Cancer Res. 61, 5710–5713. 32. Swift, M., Morrell, D., Massey, R. B. & Chase, C. L. (1991) N. Engl. J. Med. 325, 1831–1836. 33. Buchholz, T. A., Wu, X., Hussain, A., Tucker, S. L., Mills, G. B., Haffty, B., Bergh,S., Story, M., Geara, F. B. & Brock, W. A. (2002) Int. J. Cancer 97, 557–561. 34. 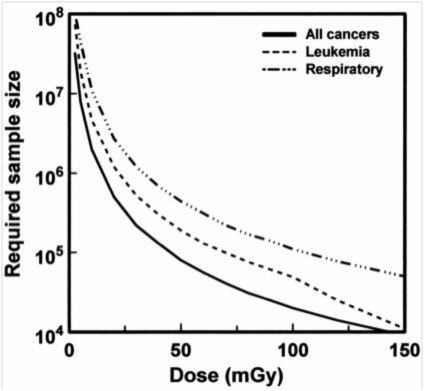 Rothfuss, A., Schutz, P., Bochum, S., Volm, T., Eberhardt, E., Kreienberg, R.,Vogel, W. & Speit, G. (2000) Cancer Res. 60, 390–394. 35. Xia, F. & Powell, S. N. (2002) Semin. Radiat. Oncol. 12, 296–304. 36. Broeks, A., Russell, N. S., Floore, A. N., Urbanus, J. H., Dahler, E. C., van’t　Veer, M. B., Hagenbeek, A., Noordijk, E. M., Crommelin, M. A., van Leeuwen, F. E., et al. (2000) Int. J. Radiat. Biol. 76, 693–698. 37. Shafman, T. D., Levitz, S., Nixon, A. J., Gibans, L. A., Nichols, K. E., Bell, D. W., Ishioka, C., Isselbacher, K. J., Gelman, R., Garber, J., et al. (2000) Genes Chromosomes Cancer 27, 124 –129. 38. Bhattacharjee, D. & Ito, A. (2001) In Vivo 15, 87–92. 39. Joiner, M. C., Marples, B., Lambin, P., Short, S. C. & Turesson, I. (2001) Int. J. Radiat. Oncol. Biol. Phys. 49, 379–389. 40. Ueno, A. M., Vannais, D. B., Gustafson, D. L., Wong, J. C. & Waldren, C. A. (1996) Mutat. Res. 358, 161–169. 41. Wolff, S. (1998) Environ. Health Perspect. 106, Suppl 1, 277–283. 42. Azzam, E. I., Raaphorst, G. P. & Mitchel, R. E. (1994) Radiat. Res. 138, S28 –S31. 43. Gadhia, P. K. (1998) Mutagenesis 13, 151–152. 44. Ballarini, F., Biaggi, M., Ottolenghi, A. & Sapora, O. (2002) Mutat. Res. 501, 1–12. 45. Sawant, S. G., Randers-Pehrson, G., Geard, C. R., Brenner, D. J. & Hall, E. J. (2001) Radiat. Res. 155, 397– 401. 46. Brenner, D. J., Little, J. B. & Sachs, R. K. (2001) Radiat. Res. 155, 402–408. 47. Brenner, D. J. & Sachs, R. K. (2002) Int. J. Radiat. Biol. 78, 593–604. 48. White, R. G., Raabe, O. G., Culbertson, M. R., Parks, N. J., Samuels, S. J. &　Rosenblatt, L. S. (1993) Radiat. Res. 136, 178–189. 49. Brenner, D. J., Curtis, R. E., Hall, E. J. & Ron, E. (2000) Cancer 88, 398–406. 50. Kuttesch, J. F., Jr., Wexler, L. H., Marcus, R. B., Fairclough, D., Weaver-McClure, L., White, M., Mao, L., Delaney, T. F., Pratt, C. B., Horowitz, M. E., et al. (1996) J. Clin. Oncol. 14, 2818–2825. 51. 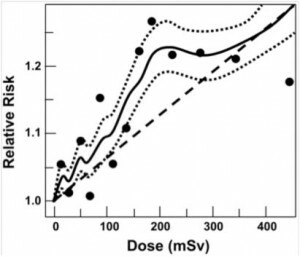 Pierce, D. A., Shimizu, Y., Preston, D. L., Vaeth, M. & Mabuchi, K. (1996) Radiat. Res. 146, 1–27. 52. Upton, A. C. (2001) Crit. Rev. Toxicol. 31, 681–695. 53. Maisin, J. R., Gerber, G. B., Vankerkom, J. & Wambersie, A. (1996) Radiat. Res. 146, 453– 460. 54. Storer, J. B., Serrano, L. J., Darden, E. B., Jr., Jernigan, M. C. & Ullrich, R. L. (1979) Radiat. Res. 78, 122–161. 55. Pollycove, M. & Feinendegen, L. E. (1999) C. R. Acad. Sci. Ser. III 322, 197–204. 56. Xu, Y., Greenstock, C. L., Trivedi, A. & Mitchel, R. E. (1996) Radiat. Environ. Biophys. 35, 89–93. 57. Cornforth, M. N., Bailey, S. M. & Goodwin, E. H. (2002) Radiat. Res. 158, 43–53. 58. Sachs, R. K., Hahnfeld, P. & Brenner, D. J. (1997) Int. J. Radiat. Biol. 72, 351–374. 59. Cucinotta, F. A., Nikjoo, H., O’Neill, P. & Goodhead, D. T. (2000) Int. J. Radiat. Biol. 76, 1463–1474. 60. Brenner, D. J., Hlatky, L. R., Hahnfeldt, P. J., Huang, Y. & Sachs, R. K. (1998) Radiat. Res. 150, 83–91. 61. 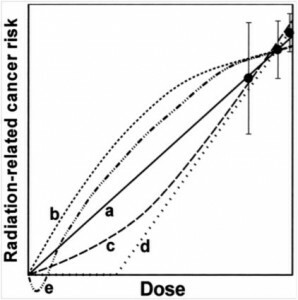 National Research Council (1999) Health Effects of Exposure to Radon: BEIR VI (Natl. Acad. Press, Washington, DC). 62. Puskin, J. S. (2003) Health Phys. 84, 526–532. 63. Kellerer, A. M. (2000) Radiat. Environ. Biophys. 39, 17–24. 64. Sinclair, W. K. (1981) Radiology 138, 1–9.